So sorry you missed the KAL! You can still download the pattern for free for a limited time. My next KAL will be in April. Be sure to subscribe to my newsletter to receive all of the details as they become available. I was late on seeing the current KAL, when will your next one start? Is there one planned for Nov or Dec? I just finished the Namesake Cowl from your book and loved it. Your teaching videos helped so much. I felt like I was sitting in class with you, learning each new technique. You are such a good teacher. I’m now leafing through the book looking for my next project. 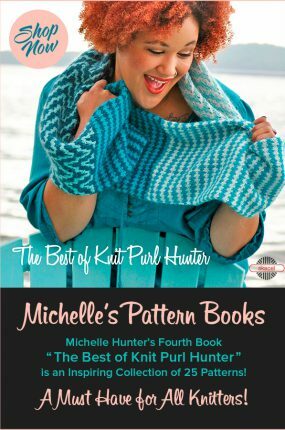 I am a self taught knitter and the way your patterns are written are perfect for me. I’m sorry but the events are not linked, but I would be happy to help. Which event are you interested in? Thanks for knitting Behind The Scenes with me! If the buttons are unavailable at any of your local shops, I know several online retailers who would be happy to ship to you. Try Fiber Wild, Knitting Temptations and Makers’ Mercantile to name a few. Picked up Building with Lace while at Fiberworks in Dayton. I can’t wait for the knit alongs! Oops, I somehow missed your comment! Here is the link to the cruise. There are only a few spots left! Dorothy, your kind word mean the world to me! I have the best job in the world thanks to wonderful students like you. Michelle I just wanted to say thank you very much for the great class yesterday. I have only taken three knitting classes and I must say you are the best knitting teacher I’ve had so far! I enjoyed the class and I learned so much in three hours – you were phenomenal. I worked in a quilt shop for five years in the Pittsburgh area and we had lots and lots of teachers for classes there. I know a great teacher when I see one, so I feel pretty confident in saying you’re top tier! Thank you again for coming out west to teach us in the Miami Valley Knitting Guild. Where do we find information about the October cruise event? Your kind words have made my day! Thank you for sharing your shop and your talents with Building Blocks. I think that you will find that you can offer this series time and time again – there is an endless stream of knitters looking to improve their skills. Happy knitting! Hi Michelle, just finished a knit a long Building Blocks. 12 of us met every Saturday morning . Various skill levels and everyone learned something new including myself. Now I establishing the next group for Building in Color! It’s so exciting for me as the store owner to watch the skill building and encouragement these knit a longs create. I love it! I have to also say that I constantly direct my customers to your site for ACCURATE lessons opposed to going to Utube! Thank you fir your video lessons. I know it is time consuming but it must also be a labor of love. Thank you for being there! I have several videos for elastic bind offs – Tubular Bind Off and Stretchy Picot Bind Off are two of my favorites. When you get a chance, could you please make a video demonstrating an elastic bind off? I would greatly appreciate it! Thanks! The pattern is not televised but only posted on the site. You may read and knit when it is convenient to you. I will be here to answer your questions daily. Looking forward to knitting together on Thursday! I just wanted to let you know that I am going to participate in your KAL Oct 2 but will not be there when you first televise. I have a long dentist appointment that morning. Thanks so much. I am looking forward to this experience! I would love to knit with you! I will be teaching Navajo Knitting and Novelty stitches. I am teaching for the Northwoods Knitters and Purlers at the Woodruff Community Center. I am unsure if the event is open to non-members but I can check if you would like. Michelle, I am going to be in Janesville, WI on August 15-17 for my companion’s high school reunion. I noticed that you will be in the Northwoods on 20 August. I would really like to meet you. What type of event will this be? Where can I get more information? At least I can see you again – I can’t wait! Unfortunately I will not be able to attend your classes this time around At A Good Yan. But I hope to be there Sat. and look forward to the have a chance to meet you. How can I forget someone I couldn’t remember? Ha, ha, I do remember you, Julie! I will be back at A Good Yarn with new classes and would love to knit with you again. Looking forward to seeing you! I was at your Sarasota workshop last year and notice you will be there again in Feb. I was wondering if you were going to do the same projects as last year. If it is something new I’ll be there for sure. Thoroughly enjoyed last year. Really wanted to some of your KAL’s but didn’t have the time this summer. It has been crazy since we returned to IL in April. Ready to head south!!!! I don’t know if you remember me or not. I was the one whose name you couldn’t remember. boot cuff/sock tops is what I mean.Not the whole socks. I’m sorry that I don’t have a boot top pattern. I would suggest looking on Ravelry. Good luck! 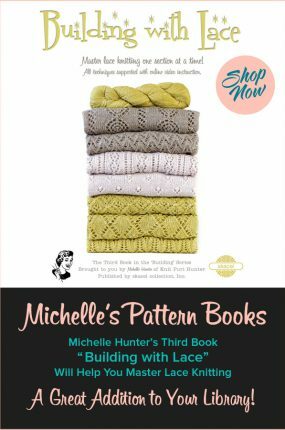 Michele I am looking for a pattern for boot top socks. Do you have one? any suggestions where I can find one? Thanks, Marty Pendleton. Thanks Kim! Please tell Dana that I will be in the Skacel booth most of the weekend and would love to meet her. Perhaps we can arrange some workshops in the shop so I can meet all of the budding knitters:) Are you the Building Blocks instructor? 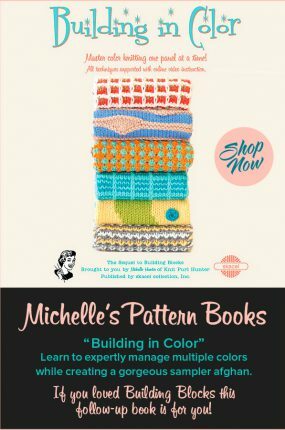 Michelle…I will tell our shop owner, Dana Nelms, to seek you out at TNNA! The Building Blocks classes are so successful…we have to keep adding 2 sections every month or so! In July we will start our 7th and 8th sessions. And we will be adding another class to teach Intertwisted! You have a lot of new fans from our classes. Again, loving your work! Is there a new book coming out soon????? I just filmed that video today so look for it to be on my website in about a week. Sorry for the delayed response! I am so excited to have you teaching Building Blocks. Isn’t it great fun to watch your students grow their knitting skills? I will have to come down and visit the shop! Michelle…my sister is Randi Fatzinger (Westlake OH! 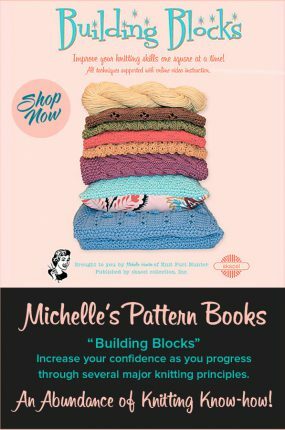 )…she was visiting and I was extolling the virtues of “Building Blocks” which I was about to teach and she says…is that book by Michelle Hunter? I was totally blown away because who knew??? I am teaching no less than 5 sections of Building Blocks at Bliss Yarns in Brentwood, TN…and 2 sections of Triplicity! My students LOVE your methods and your videos. Thanks so much!